Knob and tube wiring is a kind of electrical wiring that consists of copper wiring, one hot and one neutral, being run through porcelain knobs and tubes. The wiring is covered in insulation. The knobs hold the wire in place, often in contact with a component of the house, such as wooden beams. The tubes, on the other hand, are used to protect the wire from fraying or being in contact with wood or drywall – anything that would start a fire from overheating even with the insulation around the wiring. Knob and tube wiring was considered innovative technology during the late nineteenth and early twentieth centuries. It was a cost-effective setup that did its job in meeting the energy needs of the people of that time. However, it did have its drawbacks and is considered a safety hazard in today’s electrical codes. For example, the insulation around the wiring wears easily, which can leave the wires exposed and loose. One of the downsides of knob and tube wiring is the limited amperage. Back when knob and tube wiring was popular, people did not use as much electricity as we do today. Knob and tube wiring can handle, at most, around 60 amps, whereas today the service panels of most houses today crank out at least 150 amps. One of the biggest downfalls of knob and tube wiring is the lack of a ground wire. Ground wires did not become commonplace until the 1960s. Ground wires help protect against fires and other damage to electrical components by conducting excess electricity harmlessly into the ground. Knob and tube wiring can easily cause electrical fires due in large part to not having a ground wire. Covering knob and tube wiring with thermal insulation is a major fire hazard. It is also a violation of the National Electrical Code to have knob and tube wiring in contact with thermal insulation. The wire suspended by the porcelain knobs cannot cool if it is covered with insulation. It’s also worth noting that switches on knob and tube wiring were usually on the neutral wire instead of the hot wire. Doing that only shuts off the circuit and not the current, which can be a fire hazard too in the presence of thermal insulation. If you live in a knob and tube wired house, it’s a good idea have an electrician come out and replace it with more modern and safer electrical wiring. There is a good chance you won’t be able to get homeowners’ insurance with it still in the building. You can learn how to replace knob and tube wiring as a professional electrician. If being an electrician is your calling in life, there’s no better place to start your journey in the Chicago area than Coyne College. 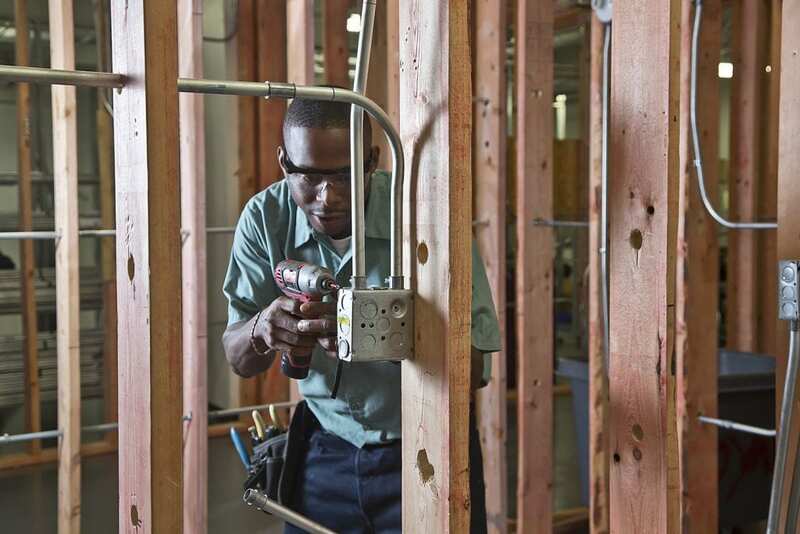 Coyne College, one of Chicago’s finest trade schools, offers two programs for aspiring electrical workers: electrical construction and planning and electrical construction maintenance. Both programs are available during days and nights at the Coyne’s Chicago Loop campus at the intersection of State and Madison Streets. At Coyne College, we’re dedicated to helping you fit an education into your busy schedule. The electrical construction and planning program can be completed in as few as 78 weeks. The electrical construction and maintenance program, on the other hand, can be finished in 42 to 56 weeks, depending on whether you take day or night classes. You will learn the ins and outs of the electrician trade in a setting that focuses on your individual success and be taught by Coyne’s highly knowledgeable instructors who have years of real-world experience under their belts. Coyne College career services department can help students with job placement, including apprenticeships. Coyne College has more than 110 years of experience in helping transform students with dreams into qualified, skilled trade professionals. Discover all that Coyne College has to offer and begin your journey to a new career today by visiting Coynecollege.edu. © 2018 Coyne College. All rights reserved.